Sheldon Casavant is one of Canada’s most highly sought after performers, with a repertoire of magic that is contemporary, fun, and highly interactive. Sheldon performs regularly at corporate events, theatres, festivals, and schools. From intimate gatherings to audiences in excess of 25,000 people, he has entertained across Canada, the United States, Mexico, Panama, China, and has performed over 630 shows in Japan. Sheldon was nominated in 2009 and 2010 as Entertainer of the Year by the Canadian Events Industry and was selected to perform at the 2010 Winter Olympics in Vancouver. 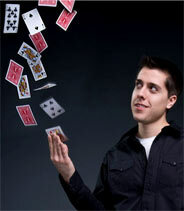 If you are looking for a magician with international experience, contact Sheldon Casavant. Visit www.sheldoncasavant.com for more information.